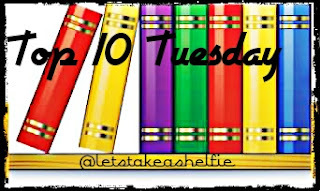 This week's Top Ten Tuesday mission was to highlight ten bookish people you should follow. Let's Take A Shelfie has been around for just over a year. I'm super excited about this week's theme. Next up are a few of my favourite Bookstagram accounts. Be warned, these accounts will likely make you drool and cause a sudden urge to run to your nearest book store. A blog that I recently started following is Tea Time with Marce. Marce's blog has a great variety of new releases and back titles. Her reviews are engaging and include a variety of media to enhance her readers' experience. Finally, a neat feature of her site is her "My Cup of Tea Blogs" which list the latest posts from her favourite bloggers. The tenth and final spot goes to Janet Joy Wilson. An Executive Sales Director at Penguin Random House Canada who enjoys sharing her love of books with the world. You can find her on Twitter: @jsquaredink or on TV doing live spots on The Morning Show talking about books we all should read. You can learn about the TMS Book Club here. I really love this week's theme and can't wait to stop blog hopping which I know will lead me through a rabbit hole of other fantastic bookish people. With that said, leave me your link below so the hopping can begin! Top Ten Tuesday is an original bookish meme created by The Broke and the Bookish. For the list of future top ten topics or details on how to participate, click here. It's so hard not to want to showcase the books you love so much. So, I had to create one just for them. Brilliant list! :-) I want to check out some of these now! Ooh nice! More people who I think I do follow! I love our bookish community! Great picks! So many new book spots to follow! Love it! Thanks for the mention! I've been wanting to be more involved in the book blog community. Happy to do it Jennifer! Your passion for Canada Reads last year and some of the discussions we had via social media really helped spark my interest. I am so honoured that you have featured my blog in your top ten, SWEET. It has been great getting to know your book choices and blog too, love the blog title. My Cup of Tea blogs is a feature that helps me keep in touch with my favourites easier and quicker so that made me smile to see what works for me works for others too. Thanks again, enjoy the week. You're so welcome Marce! Looking forward to reading more great reviews on your blog. Great picks this week. This weeks topic has to be one of my all time favourites, I have managed to find some brilliant bookish people to follow. Thank you for your great recommendations, quite a few of these are new to me and I am excited to check them out :) You can see my picks here. Thank you Charnell. Glad I could help introduce you these awesome people in the book community.